For those of you who have visited the best little brewery in Chino, I & I Brewing, and have wanted to bring some of that fresh brew home with you, your wish has been granted. Growlers are now available for filling with select brews. Which brews, you might ask? Whatever the brewery has a backup keg of, which means the selection will vary from day to day. We’re hoping for a backup keg of the Ginger Strong Ale soon. I & I Brewing is at 14175 Telephone Ave., Suite J, in Chino. The tasting room is open from 4 to 9 p.m. on Fridays and from 1 to 9 p.m. on Saturdays. No, not double coupons as in get $1 off a burrito instead of 50¢, but double coupons as in Baker’s Drive-Thru has two coupons posted for its Facebook fans. First up is today’s 60th anniversary coupon, which is a BRC (beans, rice and cheese for the unhip) burrito for only 60¢. This coupon is good at all Baker’s locations and is valid today (March 28) only. The other coupon is in celebration of the opening of the new Rancho Cucamonga location at 12009 Foothill Blvd. That coupon is for a free combination burrito and is valid both today and tomorrow (March 29), but only at the new location. Click here for the 60¢ BRC burrito coupon, valid at all Baker’s locations. For the free combination burrito coupon (valid only at the new 12009 Foothill Blvd., Rancho Cucamonga location), click here. You can either print the coupons or display them on your mobile device. There is the usual limit of one offer per coupon per person or per car per day. The offers are not valid with any other offers or discounts. Regular followers of this blog know that Inland Empire-based Baker’s Drive-Thru is very generous with deals and freebies for its Facebook fans (in addition to the chain’s easier-to-get-to weekly coupons), so be sure to like them on Facebook. 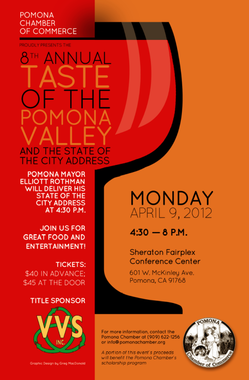 It’s two, two, two events in one as the Taste of the Pomona Valley and Pomona Mayor Elliott Rothman’s State of the City address have been combined into one event. The combined event is set for Monday, April 9, with the State of the City address beginning at 4:30 p.m., followed by the Taste of the Pomona Valley from 5 to 8 p.m., at the Sheraton Fairplex Conference Center, 601 W. McKinley Ave. The Taste offers a variety of food and wines from local restaurants, exhibitors from around the Inland Valley, live entertainment, and opportunity drawings for gift packages. Tickets for the drawings will be $5 each, or $20 for an arm’s length of tickets. Tickets for the event are $40 in advance (or $45 at the door) and available from the Pomona Chamber of Commerce. For more information about tickets, booth opportunities or sponsorships, contact the Chamber office at 909-622-1256, or any Chamber of Commerce board member or Ambassador. Update: If you’re interested in attending, you might want to check out the current Groupon deal. You can purchase up to two tickets at only $25 each, and each ticket includes $10 in raffle tickets, which means you’re getting a $50 deal for half price. It looks like the deal’s expired but still available, so it could end at any moment. Click here for the deal. It’s been reported that “pink slime” is in an estimated 70% of grocery store ground beef. But the ammonia-treated meat trimming filler has never been in the ground beef from fresh & easy. While other grocers are quickly changing their ways and attempting to rid their shelves of the stuff, you can easily get rid of it from your refrigerator shelves. You can find fresh & easy markets throughout the Inland Empire, except, notably, Loma Linda. 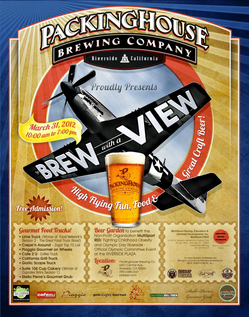 Packinghouse Brewing Company is hosting a “Brew with a View” event from 10 a.m. to 7 p.m. Saturday (March 31) at the brewery, 6421 Central Ave., Riverside. You see, the brewery is right across the street from the Riverside Municipal Airport, where the Riverside Air Show will be taking flight from 9 a.m. to 4 p.m. The event will feature a beer garden, with proceeds benefiting the non-profit MultiSport RED, and eight food trucks, including the I.E.’s very own Stella Pierre’s Gourmet Grub, Suite 106 Cupcakery and Cafe 2 U.
Click over the jump to see a full list of scheduled trucks. Beer lovers, mark your calendars for tomorrow (March 28)! That’s when bottles of the fourth in Hangar 24 Craft Brewery’s Barrel Roll series, Hammerhead, will be available to reserve. The limited-edition brew, an American-style Barleywine aged in rye whiskey and bourbon barrels, will be sold in 750 mL bottles and on tap at the brewery, 1710 Sessums Drive, Redlands, beginning at 11 a.m. Saturday (March 31). Approximately 5,500 bottles have been produced. A limited number will be available for reserve beginning at 4 p.m. Wednesday at the brewery. Each bottle costs $20 and there’s a per-customer limit of one case. Once again, the fine folks over at [desi]gn cakes & cupcakes will be opening their doors to the public. The open shop will take place from 7 to 8 p.m. tomorrow (March 28) at their commercial kitchen, 13641 Central Ave., Suite F, in Chino. Their churro (as seen during their Cupcake Wars appearance) and award-winning red velvet cupcakes will be available for purchase. Although, I missed their most recent event, I attended their first open house and had a chance to taste the bakery’s two entries at this year’s L.A. Cupcake Challenge: Buffalo chicken and churro. Let’s just say it was worth the drive from San Bernardino, even at today’s gas prices! Veterans of Foreign Wars Post 8680 in Rancho Cucamonga is hosting another steak dinner from 6 to 8 p.m. Saturday (March 24). Dinners include choice of steak, grilled to order, baked potato, salad, vegetable, roll and butter. Free karaoke, hosted by Darren Miller, will start at 7:30 p.m. and continue until 11:30 p.m.
All proceeds benefit the post’s programs for veterans and their families. VFW Post 8680 is at 8751 Industrial Lane. For more information, call 909-980-5220 after 4 p.m. Mother Nature 1, Yum! Festival 0. The Yum! Festival, originally scheduled for Sunday (March 25) at Ontario Mills is being rescheduled due to thunderstorms in the weather forecast. Promoters will announce a new date early next week. You’ll still be able to get full, just not this weekend. Update: The new date is Saturday, June 23. All pre-sale tickets purchased for the original date are being refunded. You’ll have to re-purchase tickets when the new date is announced (or simply purchase at the door). Tickets won in contests (like ours) will still be honored.